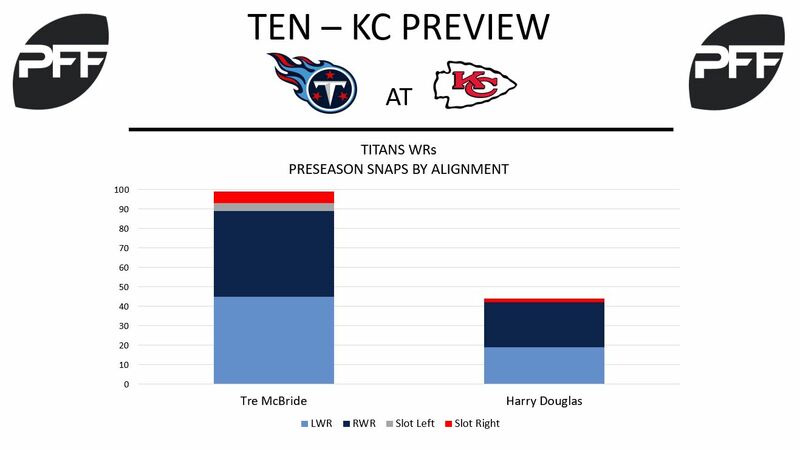 If the Titans elect to keep six receivers, Douglas, McBride and Weems will vie for the final spot. Douglas, who missed Sunday’s matchup against Chicago with a knee injury, has caught all four of his targets for 55 yards. He leads the team with a wide receiver rating of 118.8, and his 1.96 receiving yards per route run ranks third. McBride has a wide receiver rating of 104.4 this preseason. He’s averaging 1.49 receiving yards per route run. Additionally, he’s caught one of two passes targeted 20-plus yards downfield. Weems would likely make the roster strictly for his work on special teams, as he’s played only eight offensive snaps this preseason. Josh Carraway, ED – With the emergence of Aaron Wallace this preseason, Carraway’s spot on the 53-man roster isn’t guaranteed. The seventh-round pick is second on the team with a pass-rushing productivity of 7.0 this preseason. He’s also second with a run-stop percentage of 6.5. Kalan Reed, CB – Reed has allowed .30 receiving yards per coverage snap over the past three weeks. Quarterbacks throwing into his coverage have averaged a passer rating of 44.9. He’s also registered a run-stop percentage of 7.5, which ranks seventh among cornerbacks that have played a minimum of 18 run snaps. David Fluellen, RB – Fluellen has nearly solidified his spot as the team’s No. 3 running back with his play this preseason. His elusive rating of 144.7 ranks fifth among running backs that have a minimum of eight rushing attempts. Additionally, he’s averaging 1.64 receiving yards per route run, and he has a pass-blocking efficiency of 90.0. 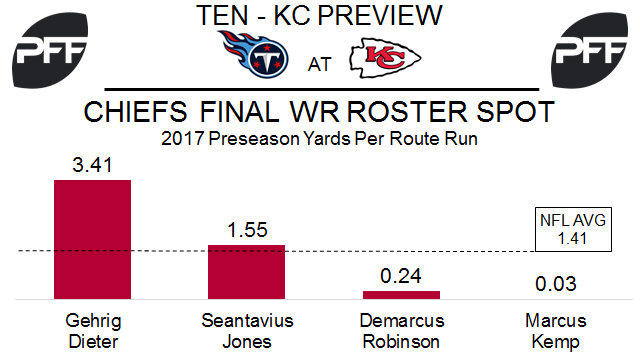 Kansas City veterans Tyreek Hill, Chris Conley, Albert Wilson and De’Anthony Thomas are the team’s top four wide receivers, and Jehu Chesson was a fourth-round pick this year. That leaves one remaining roster spot for a wide receiver if the Chiefs keep six. Robinson, a fourth-round pick in 2016, was the favorite for this roster spot in training camp but hasn’t been effective this preseason getting targeted only three times and catching one pass for seven yards. If Kemp is going to make the team it’s likely going to be because of special teams. He only has one catch for one yard this preseason, but has played 32 snaps on special teams. Jones has caught all three of his targets for 31 yards and one touchdown, and a passer rating of 149.3 when targeted that’s 12th among all wide receivers. One longshot who’s more likely a candidate for the practice squad is Gehrig Dieter, who leads the team with 3.41 yards per route run this preseason. Tanoh Kpassagnon, DL – The Chiefs second-round pick this year, Kpassagnon has showed some pass rush ability with four pressures in 35 pass rush snaps this preseason. He is 15th out of 64 3-4 defensive ends with 20-plus pass-rush snaps in PFF pass-rushing productivity (pressure on a per snap basis with weighting toward sacks). Reggie Ragland, LB – Kansas City traded a 2019 fourth-round pick for Ragland this week, who missed his entire rookie season of 2016 with a knee injury. This preseason he has an overall PFF grade of 78.6, which ranks 24th out of 180 linebackers with 40-plus snaps. 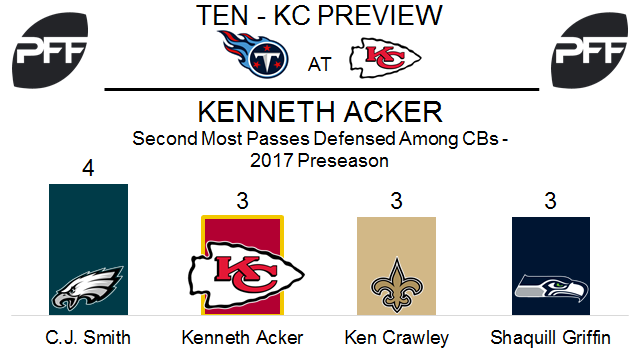 Kenneth Acker, CB – Acker is making a push for a roster spot after being the highest-graded Chief against Seattle, with an 82.6 PFF grade that was tenth among all qualifying cornerbacks last week. He has three passes defensed this preseason which is tied for second most at cornerback.